Sulfate free surfactants. Beauty pure and simple. Indulge your tresses with this exotic formula with kukui nut oil, an ancient Hawaiian secret. This humidity resistant formula helps to create a shimmering gloss, smooth texture and repel humidity, to help make every day a 'good hair' day. Hair care system* *Includes shampoo and conditioner Why You Want It... 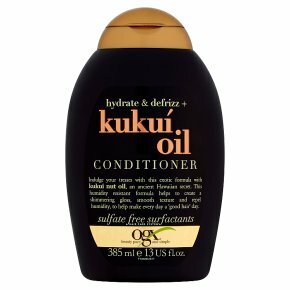 This formula with kukui nut oil helps to make tresses frizz free, incredibly smooth and glossy, to help make everyday a 'good hair' day! Directions for Use... After shampooing, apply conditioner generously to hair, working through to ends. Wait 3-5 minutes. Rinse hair thoroughly. For best results use in conjunction with other OGX products. Warning: Use only as directed. Avoid contact with eyes. If contact occurs rinse immediately. Keep away from children.